Elihu Yale himself donated Yale College's first two medical volumes. A century later, in 1813, the Medical Institution of Yale College was opened with the help of Yale president Timothy Dwight and the Connecticut State Medical Society. A separate medical library was begun in 1814. By 1865, when a catalog was made of the collection, it numbered 1,200 volumes. In that year, however, the volumes were integrated with the College Library. It was not until 1917 that another separate medical library was begun by the professors of the Medical School. The current medical library building, completed in 1940 and dedicated in 1941, connects to the Sterling Hall of Medicine, which was built in 1925. The Yale Medical Library was designed in the shape of a Y with two wings, one for the Historical Library reading room and one for the current periodical room, and stacks below for books and journals. The central rotunda honors Harvey Cushing (1869-1939), the father of neurosurgery, who graduated from Yale College in 1891 and returned to Yale in 1933. The library's fine historical library was conceived in 1935 when three physicians, Harvey Cushing, John F. Fulton, and Arnold C. Klebs, agreed to donate their major collections of early texts in the history of science and medicine to Yale. These collections, including the incunabula, Robert Boyle, William Harvey, Andreas Vesalius, Hippocrates, and Galen Collections as well as the 16th, 17th, 18th, 19th and 20th Century Collections are shelved in a closed sub-stack area. The Historical Library's holdings also include an excellent print collection and a world-famous collection of weights and measures. In June 1990, a gift from Mrs. John Hay Whitney, daughter of Harvey Cushing, made possible the completion of a major renovation and expansion project, resulting in the addition of the modern sky-lit Information Room and increased study and stack space. The Library was renamed the Harvey Cushing/John Hay Whitney Medical Library, honoring Cushing and John Hay Whitney (1904-1982), Yale graduate, editor of the Herald Tribune, and patron of the arts. The Cushing/Whitney Medical Library serves the biomedical and health care information needs of the Yale-New Haven Medical Center and the University, as well as providing service to area physicians and medical libraries. The collections cover clinical medicine and its specialties, the pre-clinical sciences, public health, nursing, and related fields. They also include the Historical Library's distinguished holdings. The library now contains more than 416,000 volumes. The Morse Periodical Room is a bright, spacious area housing the Library's small print journal collection and historical and biographical books. This room has become an indispensable facility for library users; a calm and quiet atmosphere attracts students who have discovered that the periodical room is a perfect place to study. Support from Mrs. Belle Morse enabled Yale University to create the Morse Reading Room in honor of her husband, Carl A. Morse '25s and their son, Stephen I. Morse '51, M.D. Carl A. Morse (1905-89) was born in Minsk, Russia, and raised in New Haven. He graduated in 1925 from Yale's Sheffield Scientific School with a degree in engineering. As head of Morse Diesel, Inc., a building design and construction firm, Mr. Morse created such New York landmarks as the Pan Am Building and the Marriott Hotel in Times Square. Among his many gifts to Yale is the Belle and Carl Morse Scholarship Fund. This fund was established in 1989 to assist disadvantaged Yale students who have graduated from New Haven's Hillhouse High School, which he also attended. Morse scholars are requested to return to Hillhouse to inform younger students of the opportunities available to them at Yale. Stephen I. Morse M.D., Ph.D. (1930-80) was born in New York and graduated from Yale in 1951 as a member of Timothy Dwight College. He received his M.D. degree from Washington University School of Medicine. As professor and chairman of microbiology and immunology at the State University of New York Downstate Medical Center (now the SUNY Health Science Center at Brooklyn), his research centered on the study of microbial products and their effects on host responses. The University's present Medical Library was founded in 1941, largely due to the efforts of Dr. Harvey Cushing and two other renowned medical specialists, Dr. Arnold C. Klebs and Dr. John F. Fulton. Calling themselves "The Trinitarians", these three great figures of twentieth-century medicine gave their extensive library collections to Yale to form the nucleus of one of the great medical historical libraries of the world. Dr. Cushing, neurosurgeon and collector of the works of the early anatomists and surgeons; Dr Klebs, physician, bibliographer, and incunabulist; and Dr. Fulton, physiologist and collector of medical literature, spearheaded the development of medical history as a major field of study and made a significant contribution to the understanding of medicine and the history of culture. After graduating from Yale, Dr. Cushing received his medical degree from Harvard Medical School in 1895 and taught at Johns Hopkins Hospital and Medical School before accepting appointment as Mosely Professor of Surgery at Harvard in 1912. 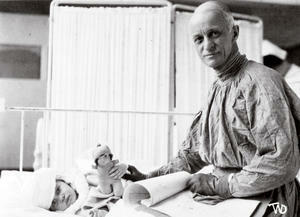 His career at Harvard was interrupted by overseas service, during which he directed base hospitals in Europe during World War I.
Dr. Cushing returned to Yale in 1933, serving as Sterling Professor of Neurology in the School of Medicine and as Director of Studies in the History of Medicine from 1933 to 1937, and as Sterling Professor Emeritus until his death on October 7, 1939. He was married to Kate Crowell Cushing for more than thirty years. Mrs. Cushing took a great interest in her husband's students and hosted teas for them at the Medical School. Dr. Cushing received many honors, including more than twenty honorary degrees, and was one of six individuals, and the only surgeon, to be elected to Honorary Fellowship in the British Royal College of Physicians. His biography of Sir William Osler was awarded the Pulitzer Prize in 1926. John Hay Whitney, a 1926 graduate of Yale College, served as United States Ambassador to Great Britain from 1957 to 1961. On his return from England, Mr. Whitney became owner and publisher of the New York Herald Tribune and Chairman of its Paris-based newspaper, The International Herald Tribune. Mr. Whitney's philanthropy helped shape higher education in the United States. In addition to substantial gifts to Yale, through the John Hay Whitney Foundation, which he established in 1949, Mr. Whitney focused on the field of education and on supporting individuals from minority groups who sought to make educational, social, and economic changes in their communities. Mr. Whitney served as a Fellow of the Yale Corporation from 1955 to 1970 and as a Senior Fellow from 1970 until 1973. In 1977, the John Hay Whitney Professorship in the Humanities at Yale was established and in 1981 a new faculty center was designated the Whitney Humanities Center. Mr. Whitney died on February 8, 1982. In 1985, Mrs. Betsey Cushing Whitney presented the University with a generous gift to expand and renovate the medical library.